“Amazing Grace, how sweet the sound, That saved a wretch like me….! Officially back home from Costa Rica and I appreciate the show of interest in the first installment of great photos from time spent in Copey. I hope everyone will enjoy today’s second installment. We had the honor of sharing the graduation ceremony with the two Copey Learning Center graduates for 2017. Both are excellent students and 13 years old. We should plan to see them at E&H College for the “Pathway Project” in the future. Also, please notice the student standing next to me. This is Mariana, our Spelling Bee superstar. She and her fellow student are both wonderful young ladies and excellent role models for younger students. We were treated with instrument playing by the Copey Learning Center students. One selection was “Amazing Grace”. How wonderful! It is a favorite of mine and certainly one of Anne G. Broady’s favorite hymns. Hearing the music reminded me at that moment how much Mom has been a part of this entire project. Another group did one of Costa Rica’s many cultural dances for the audience gathered for graduation. This dance involved the “Condor”. Their costumes and music provided an unforgettable pageantry. Then we were blessed with the song “This Little Light of Mine” led by musical director, Jane. This song was so relevant and appropriate for the occasion. I sat wishing the message of the song could be something each “Friend of Copey” could witness in the voices of each child on stage. We are all children, we all have a light, and we all have the potential to brighten up this world if we only decided to. 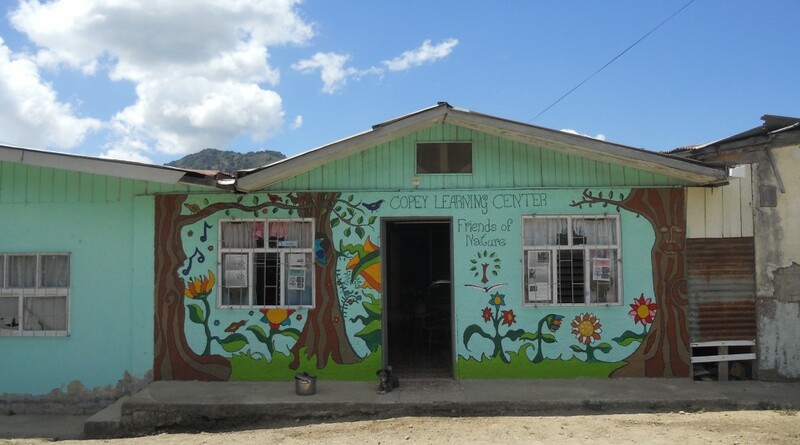 Finally, “Friends of Copey” received a gift from the Copey Learning Center. The words “all our thanks for your support, dedication, and affection so that this project today is a reality in our community” are contained on the plaque. I was so honored to receive this expression of gratitude for so many reasons. This is the first time in the history of Friends that we have been publicly honored for our support. Enjoy this! It came from a grateful community and it was my pleasure to receive it on behalf of all the “Friends of Copey”. We can tell all that we have been “internationally recognized” for our service. One of the best decisions I have made in life lately was to travel to Copey and attend the Copey Learning Center’s 2017 Graduation ceremony held Friday night. I do not think I have had a more enjoyable and magical time than being there for the celebration. I met Copey friends, students and their families, the volunteer teachers, the Center’s Board of Directors. Ana Yancy, the Center’s Director; Larry and Cindy, our architects and building consultant; and of course Jane…our volunteer superstar who I knew in college, were all present. There were so many great things that happened and I will try over the next few weeks to share most of these special moments with you. Saturday morning a wonderful breakfast was prepared for the Board, students, volunteers, Carol, and me. There is no one who can out-perform the Copey community when it comes to hospitality and making others feel special. “Friends of Copey” is something very special in the eyes of these folks. We are appreciated, respected, and held in the highest esteem. Our help is valued and we are true partners and being together this weekend cemented this relationship. The year 2018 will only serve to deepen this commitment and devotion we share for the Copey Learning Center’s Mission. So I have much to say and share but for now I prefer to just provide some of the memorable photos for you to enjoy. Pictures seen in order: Group photo at Breakfast with Board, students and volunteers; five students with E&H connections/all but one has been to E&H; Board member Lilliana with daughter; Jane and Arthur with Ana Yancy and three new students selected for the “Pathway Project 2018”; and Jane with her favorite friend. There are many more photos to share with some exciting new developments to report in future weeks. Life is very good…with “Friends in Copey”! We are on the front end of Thanksgiving Week and I wish all the very best and hope we all find time to think about the many things we have as a country to be thankful for. This is “Friends of Copey’s” fourth year enjoying Thanksgiving and our list of things to be thankful for is very long. The results of the Spelling Bee are in and our very own Copey Learning Center student Mariana finished 5th in the National Competition. The report indicates she was among the youngest competing and performed exceptionally well. She is destined to be champion soon. We all congratulate Mariana. She is our winner and we are grateful to have her competing on the national stage bringing both honor and respect to the Copey community and the Learning Center. Also, again thank you for helping provide funds to allow her mother Lorena to attend the event with Mariana. About this time next week, Jane will have returned to America to her family and friends. Certainly she will enjoy sitting in her favorite chair, catching up on “Days of Our Lives”, and even sleeping in her own bed after three months. Her final official day of service is Friday when the Learning Center conducts its annual graduation services and closes for a couple of months for their summer. “Friends of Copey” will be there to attend the graduation and be among others to share Jane’s final hours. She has been one of the most colorful and amazing volunteers to hit Copey and she will be missed. Here are my two favorite “Jane” quotes I have posted during her time in Copey. This first quote is priceless about Jane as she explains how she got involved. This quote speaks volumes about Copey and the Learning Center. For four years “Friends of Copey” has enjoyed success because this unique collection of “friends” simply desires “to make a positive difference”…to be difference makers”! Jane is the “poster child” for all of the “Friends of Copey”. God Bless You Jane! When the Learning Center starts again in February, there will be a new “Pen Pal” waiting to meet the Learning Center students. I will save the full details for later but an elementary school in Utah has agreed to become our educational partners to help the Learning Center get off on a great start in February. Their plans include providing other types of support to the Learning Center as well. This is very exciting and something very positive to look forward to in 2018. When I depart for Costa Rica tomorrow, I will be carrying all of you…”Friends of Copey” in my pockets, my luggage, and most of all…in my heart. No one could possibly feel more blessed and honored than me to go to Copey and represent this entire collection of people aka “Friends of Copey”. Without exaggeration, this unconventional approach to offering and providing needed educational support to a community is most unique. The ability do something meaningful and successfully for others because we believe we can in this fashion is “service to humanity” at work. Thanks to All! We have great news! Out of the three students, we were successful in placing one student in the finals. Mariana has again demonstrated her excellent English skills and for the second consecutive year, she is heading to the final competition…The Nationals. Both Celeste and Margaritas placed very high and came close to winning their competition. Congratulations to both of them as we recognize being among the top three finalists is a huge success in view of the extremely tough competition they both faced. The Nationals are scheduled for next Tuesday and “Friends” plans to provide some financial assistance to Mariana’s mother (Lorena) so she can attend the event to support her daughter just as she did last year. The rules of the competition only allows one family member to attend and no Learning Center staff are permitted. Last year, we provided $200 to help offset some of Lorena’s travel and living expenses. We want to do this again so I am putting in the first $50.00 and invite others to voluntary match or chip in if you want. The funds need to be in Lorena’s hands by mid-day Friday in order for her to have access to the funds in time. So our response is urgent to get the funds to her. Or, due to the short notice, it may be more convenient for some to contact me directly via email with a pledge. I will submit the pledged amount to the same PayPal system on your behalf and will provide a PayPal receipt to you. I can be reimbursed at your convenience. Just send me a note at atbroady@aol.com. I just returned from southwest Virginia, the area I grew up in. I really enjoy seeing some of my childhood friends, spending time with my family, working with my colleagues on campus, and visiting some of the “Friends of Copey” who reside there. All of this was squeezed into a five-day visit. Emory & Henry College and “Friends” are committed to continue the “Pathway Project 2018”. This is a great relief knowing we are on track for another year having students engaged in this unique educational exchange opportunity. I was in Jane’s hometown area this past week and while on campus, several folks indicated their awareness of Jane’s volunteer service in Copey. She is highly regarded and admired by those following this Blog. Many feel she is representing one of the key values of our college…“service to others”. She is now in her final month as a volunteer in Copey. I will be in Copey to attend the “graduation” service with her later in November. This will be a very special time as two E&H graduates will be very happy to represent “Friends” and our college. There will be much to write about when we return to the US. I attended church with my son and his family while I was back east. The essence of the minister’s message was to have the faith and expect prayers to be answered. Be “BOLD” in your prayers and ask for miracles…and expect that “sun standing still” event to happen. Although there has been some scientific debates regarding whether or not the sun once actually stood still, as with many Biblical accounts of this nature…it simply boils down to “Faith”. For me, I believe in being bold and expecting the unexpected to happen. And, I never get tired of witnessing the unexpected happening with “Friends”. Stay encouraged! There are more “sun standing still” miracles to be prayed for.